Charles Scribner’s Sons, New York, 1952. 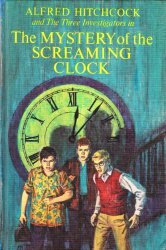 Of course, the main reason I love this book so much is that I remember my mother reading it to me. I remember all the suspense building as Jonathan’s mother and Jonathan say this refrain to themselves, and everyone is thinking about bears. I remember how the crunch, crunch, crunch of the snow changes to drip, drip, drip, which means Spring is coming, and how Jonathan hopes the bears don’t know it. And then how incredibly scary it is when Jonathan hides under the big iron pot and the bears start scraping in the snow around it. I also love what I hadn’t remembered – that this is a story of a great big extended family – a little bit like the one I have. When my mother read it to me, we still lived near my grandma, who was good at making cookies, as Jonathan’s mother is in the book. 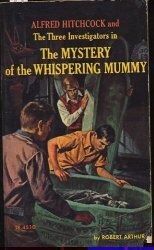 It’s rather astonishing to me, reading it now, at how well this story holds up 63 years later. About the only thing that couldn’t happen today is that nobody needs to cut wood to keep a fire going for cooking to get done. Oh, and probably Jonathan’s father and uncles wouldn’t come with guns to shoot the bear. 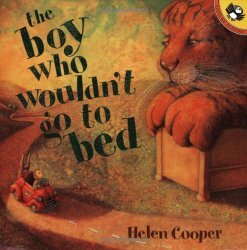 This is a chapter book – but a chapter book short enough to read aloud, as I well remember. The suspense is incredible, if child-sized. 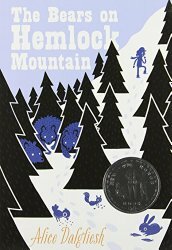 Bottom line, it’s the story of an eight-year-old who is now big enough to go over a big hill in the snow all by himself to his aunt’s house – because of course there are no bears on Hemlock Mountain. And that story will never grow old. Beginner Books, 1965. 61 pages. Today is Dr. Seuss’s birthday. As has become traditional, at the City of Fairfax Regional Library, we held a Seussathon — offering customers the chance to read Dr. Seuss books in the children’s area all day. 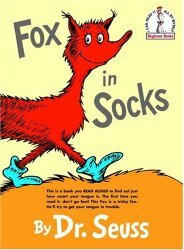 As has also become traditional, I started it off with a reading of Fox in Socks. I thought it would be fun to tell the story of my history with Fox in Socks. It’s special to me, because I can remember when my mother bought it and brought it home. I was so impressed with the words at the beginning: “Take it SLOWLY. 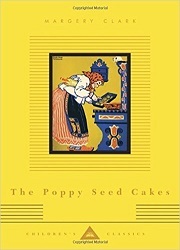 This book is DANGEROUS!” In fact, I still read those words with the same inflection my own mom gave them. I remember I asked her what that meant. I don’t remember her exact answer, but I was very impressed. And I remember her laughing when she made any mistakes. And very dramatically telling me her tongue was numb. Later, I remember *trying* to say things like “quick trick chick stack” and simply not being able to. Also “Six sick chicks tick.” And “Bim’s bends. Ben’s bends.” And the three free fleas. But I always did like Luke Luck and the Tweetle Beetles. So that’s why I have all my life (minus four years) been extra fond of this book. And then I was a big sister — big sister to ten, actually (and little sister to two) — and got many many opportunities to read to my younger siblings over the years. Not too long after I moved out and got married, I had my own son, followed by a second six years later. Yes, I made sure to buy a copy of Fox in Socks very early. Now? Well, thankfully I’m a Children’s Librarian, and I can still give myself a dose of Fox in Socks at least once a year. And this brings up the value of the book. Okay, there’s not much plot. But you won’t find a better book for building phonological awareness. You definitely notice the smaller sounds in the words, once a child is at least old enough to follow what’s being said. When they are old enough to read, oh my each letter makes a difference! And you know what? I think there’s still a little Sondy in me who is simply pleased as can be to be able to say those words quickly. Source: This review is based on an interlibrary loan via Fairfax County Public Library. Random House, New York, 1966. 158 pages. 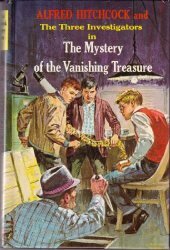 This is Book Six of The Three Investigators series, and the fourth one I’ve read in my current rereading spree. Reading them out of order so far has not mattered a bit. This one I actually remembered some crucial plot details because they are so cool, actually involving pirate treasure. I will say no more about that. This book doesn’t have anything at all about the gold-plated Rolls-Royce and Worthington, the chauffeur, but it has plenty of adventure. 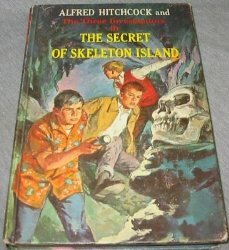 Right at the start, Alfred Hitchcock sends them off to Skeleton Island, off the southeast coast of the United States, where a company is making a movie at the old amusement park on the island. But the movie company is having trouble. Pieces of equipment have been stolen, and their boats have been tinkered with at night. What’s more, a legendary ghost has recently been seen riding the old merry-go-round. The girl died long ago when she vowed to finish her ride in a storm, but was then struck by lightning. One thing I’d forgotten was how many of these books have a stereotypical ethnic character. In this case, it’s Chris Markos, from Greece, a diver who’s trying to find pirate treasure to help his injured father. 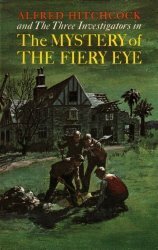 The townspeople are stereotypical and superstitious as well, easily falling for the ghost story and gossiping intensely and mistrusting Chris, the foreigner. But the overall story is fun and adventurous. Pirate treasure. Boats. Being marooned. Making a movie. Scuba diving. Lives in danger and a mystery to solve. This was a fun one to revisit. Source: This review is based on an interlibrary loan borrowed via Fairfax County Public Library. You are currently browsing the archives for the Old Favorites category.